This time of year the magazines and stores are full of glittering,shimmering, and down right glitzy decorations! Last year I went all out and decorated every door in the house, the kitchen, bathroom and any table with space! Let’s just say it was a LITTLE more than I should have done! We’ve moved to a smaller house and sold all those red and pink decorations at a yard sale. I know Tim was thrilled about that! I want to keep everything “simple and easy” feeling around here! I’m decorating with CANDY AND CANDLES! The LARGE glass jar is filled with colorful candy that’s tasty and pretty! Even the cute little boxes are full of candy. I bought them at Target, cut the tag off, and set it on the table! I know…how creative you say! The pink candle is on a white flower plate. The candy will definitely get eaten, and it’s great for bribing the kids to do school work and cleaning…just kidding (not)!!! I don’t have to pack any of it away and hope to find it in good shape next year! The little boxes of candy will be given away as a Valentine’s Day gift. The candle will be used now and for Spring decorations. No waste! No fuss! That’s why I’m decorating with candy and candles for Valentine’s Day this year! Keep it simple! That’s what works for me…Stop by Rock In My Dryer for more Works-For-Me-Wednesdays! Be sure to visit Nesting Place and read Tim’s Remodeling Guy guest post! Excellent idea! I love it! Simple is always the best! Traci Best’s last blog post..See my driveway? Cute ideas- I’m just not too sure I could leave the candy alone! I love your Tasty Tuesdays too, I’ll be back! 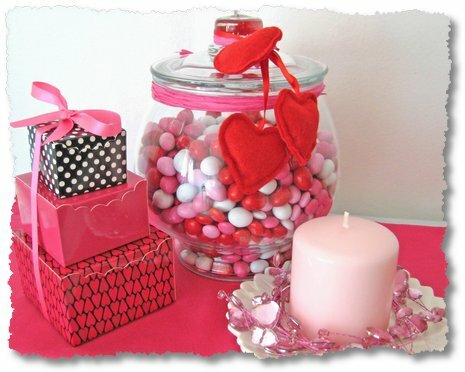 I really like the big jar filled with the candy and especially the felt hearts hanging off of it….good job. Sue’s last blog post..GOOD FOOD…..GOOD CAKE….GOOD FRIENDS…..
You can never go wrong with candles and candy, great idea! Love, love, love the candy jar! It looks so pretty with the colors in it. Where did you find the jar? I like going simple, too. I normally don’t buy anything to decorate for Valentine’s Day, but I’m going to try my hand at just a few things to spruce up a few places in our home for the month of February. Heidi @ Blue Eyed Blessings’s last blog post..frosty the snowman still lives! I just scooted over from Nester and I LOVE your valentine idea. I always struggle with my desire to be festive yet not wanting a bunch of extra holiday clutter. Thanks for sharing!! I really like this cute little display for Valentine’s. It’s simple and doable and not too over the top girly as to annoy my husband. Katie’s last blog post..My FIRST FEATURE on TIP JUNKIE!!! Tamara’s last blog post..Which Colors Should I Choose? Great idea! My only problem is keeping the candy jar stocked…hubby has quite the sweet tooth! Great idea and beautiful to look at. This is a gift that is bound to make someone smile! I love your ideas….especially the edible ones! Great Valentine’s Day ideas. I’m all about simple, and I love your idea to use things you won’t have to store! I, too, am trying to decorate with year-round accessories I can repurpose for various holidays. Love the idea of different colored candles! That is such a pretty arrangement for Valentine’s Day! Simple and pretty is just right in my book! Gayle’s last blog post..I Love My Vintage Cook Book! Mezo’s last blog post..Romantic Gifts for her!